The Bible Films Blog has an interesting post on how Satan is depicted in Jesus films. As he mentions, Satan and personified evil have also played an important role in many other film genres, including horror as I discussed briefly in The horrifying Nosferatu, personified plague and death (Satan 9). Categories: Film, History of Satan, Religion and popular culture. March 13, 2007 . The story of Adam and Eve in the first chapters of Genesis makes no explicit reference to “Satan” or the “Devil” (merely the serpent). Yet around the first century BCE or CE we first get clear signs that some Jews were interpreting this narrative in ways that clearly linked the serpent with the story of Satan as an evil-intentioned angel. God “created man to rule the world and placed within him two spirits so that he would walk with them until the moment of his visitation: they are the spirits of truth and of deceit. In the hand of the Prince of Lights is dominion over all the sons of justice. . . And in the hand of the Angel of Darkness is total dominion over the sons of deceit. . . [God] created the spirits of light and of darknesss and on them established all his deeds” (1 QS III 17-25; Florentino Garcia Martinez, trans., The Dead Sea Scrolls Translated [trans. by W. G. E. Watson; Leiden: Brill, 1994], p. 6). So there are differences in where Satan makes his entrance on the narrative time-line, so to speak. And, as time progressed, there seems to have been a tendency among certain Jewish (and Christian) authors to find the origins of personified evil at points earlier than the story of the fallen angels of Genesis 6. In some respects, this is the interpretive context in which to make better sense of the association of the serpent in Paradise or Garden of Eden with the fallen angel. This component begins to appear clearly on our radar screen in the centuries around the time that the Jesus movement emerged (first centuries BCE and CE). The expansions of the story of Adam and Eve that came to be incorporated within the so-called Apocalypse of Moses (in Greek, first century CE) and the Life (Vita) of Adam and Eve (in Latin, 3rd-4th centuries CE) likely reflect an earlier source of the first century BCE, a source which scholars often call the Book of Adam and Eve (online translations here; online resources here). In these particular expansions of the story of Adam and Eve, the blame for sin, illness, and death is placed firmly upon the first woman, Eve (in a way that diverges from the Genesis account itself, which is somewhat more “balanced”, one could say, in apportioning blame and punishment to both Adam and Eve for eating from the tree of knowledge). This association of women and Satanic deception was to continue for centuries to come, as we know; the notion that women were more susceptible to evil temptation or were more likely to be deceivers themselves still has its legacies today within our patriarchal culture (despite attempts to deconstruct just such notions or gender stereotypes). So, in the Adam and Eve expansions, Eve is presented as not learning from her mistake and is tricked not once, but twice, by the angel Satan. Once Eve gives in to Satan’s temptation (via the wise serpent) by taking from the forbidden tree (Apoc. Moses 15-30). A second time Eve is fooled while doing acts of repentance for the first mistake and follows the advice of an apparently nice, bright angel (really Satan) that God was satisfied with how much penance she had done (Vita 9-11). God was not (according to the authors of this story). “‘Why do you treacherously and enviously pursue us, O enemy, all the way to death?’ And the devil sighed and said, ‘O Adam, all my enmity and envy and sorrow concern you . . When you were created, I was cast out from the presence of God and was sent out from the fellowship of the angels. When God blew into you the breath of life and your countenance and likeness were made in the image of God, Michael (the archangel) brought you and made us worship you in the sight of God, and the Lord God said, ‘Behold Adam! I have made you in our image and likeness” (Vita 11:3-13:3; trans. by M. D. Johnson, “Life of Adam and Eve,” in The Old Testament Pseudepigrapha [Garden City: Doubleday, 1985], vol. 2, p. 262). “So with deceit I assailed your wife and made you to be expelled through her from the joys of your bliss, as I have been expelled from my glory” (16:3). Bitter revenge, jealously, envy, and covetousness is why. That was a long one, but it had to be done. Jimmy Page, “Dazed and Confused,” Led Zeppelin I (SuperHype Music Inc, 1969). Full lyrics online here. One can appreciate the raw expression of emotion in Led Zeppelin’s (or others’) performances without agreeing in any way with their opinions on things like this, thankfully. Categories: History of Satan, Women and religion. February 7, 2006 . 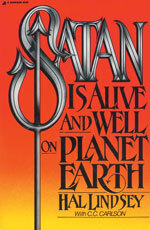 As a Jewish apocalyptic movement, the early Jesus movement (“Christianity”) inherited a worldview in which Satan played an important role as the ultimate adversary or opponent of God and his agents. Plenty could be said of the centrality of Satan’s (or his demons’) opposition to Jesus in the synoptic gospels, for instance, where the temptation in the desert at the start of Jesus’ mission draws clear attention to an ongoing struggle (further illustrated in the many exorcisms) that seemingly threatens to undo that very mission. Jesus is often presented, as in the gospel of Mark, as the beginning of the end for the evil powers that are active in the world. Most early Christians took Satan and his demons seriously and felt evil powers could be active in the real-life settings of Christians and others. So this was more than just thoughts in peoples’ heads, and Satan played an important role in real-life social and political interactions and in polemical discourses. Here I want briefly to draw attention to two main rhetorical functions of Satan in polemical discourses or discourses of the “other”. Moreover, the ultimate Opponent (Satan) could make his appearance (discursively) in struggles with (1) opponents outside of one’s group and (2) opponents within (or on the fringes of) Judaism or the Jesus movement that were nonetheless categorized as “other”, as demonic outsiders. The “demonization” of either external enemies or internal adversaries continued in various ways throughout the history of Christianity (and was characteristic of earlier polemical discourses within the context of early Judaism as well). (1) First of all, Satan and the language of evil play an important role in the “demonization” of outsiders or other peoples, including ruling powers. John’s Apocalypse (Revelation) provides an excellent example of this (written some time in the years following Rome’s destruction of the temple in 70 CE, perhaps in the 90s). The author of these visions thinks in terms of an ongoing struggle between God and his Lamb (Jesus), on the one hand, and the dragon, Satan, and his Beast, on the other. More importantly here, the dragon here is quite clearly in league with the Roman imperial power, which is portrayed as a seven-headed, chaotic beast arising from the sea in chapter 13 (with the emperor Nero in particular — as the mortally wounded head who “was, and is not, and is to ascend” [17:7-14] — on the top of the author’s mind). The “dragon gave his power and his throne and great authority” to this beast, and the people worshipped both the dragon (Satan) and the beast (the emperor), according to these visions (13:2). The rhetorical attack on the external Roman imperial power continues in chapters 17-18, where the author speaks of Babylon (= Rome — both had destroyed God’s temple in Jerusalem) as a whore who rides on the seven-headed beast and drinks the blood of the saints. For more on the imperial dimensions of the Apocalypse, see my earlier post on Worshiping the Beast / Honouring the Emperor. The use of the language of evil and Satan in relating to outsiders or external opponents would continue long after John wrote down these visions. One particularly prominent example is the way in which subsequent Christians (e.g. Justin Martyr) spoke of the gods of the Greeks and Romans as “demons” (compare Paul’s first letter to the Christians at Corinth at 10:14-22). “For such men are false apostles, deceitful workmen, disguising themselves as apostles of Christ. And no wonder, for even Satan disguises himself as an angel of light. So it is not strange if his servants also disguise themselves as servants of righteousness. Their end will correspond to their deeds” (2 Corinthians 11:12-15 [RSV]). These leaders of the Jesus movement with whom Paul strongly disagrees become servants of Satan who will share the evil one’s fate, in this discourse. “Children, it is the last hour; and as you have heard that antichrist is coming, so now many antichrists have come . . . They went out from us, but they were not of us . . . Who is the liar but he who denies that Jesus is the Christ? This is the antichrist, he who denies the Father and the Son” (1 John 2:18-23 [RSV]; compare 2 John 7-11). This is the earliest known occurence of the term “antichrist”, by the way, which would soon develop its own history in reference to a primary earthly assistant of Satan that would precede the final battle between evil and good. Among later interpreters, the beasts in John’s Apocalypse, or in the book of Daniel before it, were sometimes identified with this developing antichrist figure. Categories: Ancient ethnography and paradoxography, Apocalypticism, History of Satan. February 2, 2006 . Satan is very much a part of popular culture in the West. His story has heavily influenced the portrayal of evil in film, as we shall see, but the devil also makes his appearance in our music, including the blues and its offspring, rock-n’-roll. The profound influence of Robert Johnson, a Delta blues (or country blues) performer of the 1930s (who made just two recording sessions in 1936 and 1937), was not fully felt until the re-release of several recordings in 1961 (which the likes of Bob Dylan, the Rolling Stones, Eric Clapton, Zeppelin, and others have expressly identified as a profound influence on their work). hellhound on my trail. . . Still, the overall legend nonetheless attached itself to this performer, who was known for playing the guitar like noone else could. (This is partly because of the shared name with Tommy Johnson, another blues artist who supposedly claimed that he did sell his soul to the devil). It is this legend of selling one’s soul for exceptional guitar skills that is enacted in Oh Brother Where Art Thou? (2000). Jabez Stone: What does it mean here, about my soul? Mr. Scratch: Why should that worry you? A soul? A soul is nothing. Can you see it, smell it, touch it? No. This soul, your soul is nothing against seven years of good luck. You’ll have money and all that money can buy. (Full script online here). The legend of selling one’s soul, which continues as part of Satan’s story, is also reflected in the Simpsons episode in which poor Homer sells his soul to the devil for a doughnut (Treehouse of Horror IV). In this case, though, Homer actually robs the devil of his due in the long run. Categories: History of Satan, Music, Religion and popular culture. January 24, 2006 . When reading the Hebrew Bible (a.k.a. “Old Testament”) for historical purposes, it is important not to project back into its pages later developments in Judaism and Christianity, and this is particularly true in the case of “Satan”. Although there is no full-blown notion of personified evil in Israelite religion, there are indeed important messenger or angelic figures associated with Yahweh (“LORD”), God of the Israelites. Sometimes these figures could later on be associated with the notion of Satan as a thoroughly evil figure. (“Israelite religion” is the term scholars often use to refer to the religious life of the Hebrews before the Babylonian exile of 586 BCE, while “Judaism” is generally used in reference to developments following the return under Cyrus and foundation of the second temple in Judea, hence “Second Temple Judaism”). Here I want to briefly discuss three closely related, recurring figures associated with Yahweh’s (God’s) heavenly entourage or council: (1) “the adversary” (ha-satan), (2) the injurious, or evil, spirit (rucha ra’a) and (2) the “messenger” (mal’ak). 1) The Hebrew word for an opponent, prosecutor, adversary, or one who obstructs, satan, occurs in a number of places in the Bible, sometimes in reference to human opponents and sometimes in reference to a figure sent by God. In 2 Samuel 19:22 and in 1 Kings 11:14-25, for instance, the term satan is used of human adversaries of the protagonists (David and Solomon). In most other cases, it is a heavenly figure or messenger (mal’ak = Greek angelos) that God sends to act as an obstruction, adversary, or accuser (see, for instance the story of Balaam in Numbers 22, especially verse 22). The most well-known case of “satan” is the adversary among the “sons of God” (bene ha-elohim) in The Book of Job (chapters 1-2; seventh-fourth centuries BCE). This figure acts almost as a legal prosecutor in challenging Job’s piety and in letting loose severe treatment (e.g. killing all of Job’s 10 children) as a test, all with the active consent of God. The adversary is by no means an evil figure opposed to God in this story (online resources for Job here). The closest we come to the notion of an angelic adversary (satan) going against the will of God and perhaps even needing to be stopped is in Zechariah (c. 520 BCE), where “the satan” is a prosecutorial figure against Joshua, and Yahweh “rebukes” the satan for accusing Joshua in this particular case (see Zechariah 3; also see 1 Chronicles 21:1, where a “satan” apparently opposes Israel, but with little clarification by the author). There is no indication that these angelic figures are inherently evil in an ongoing manner, however. 2) A recurring figure in the Hebrew Bible sent to do God’s work, either in opposition to or in support of humans, is the mal’ak, or messenger (translated in an ancient Greek translation of the Bible [LXX] as angelos and now often as “angel” in English). Thus, for instance, it is an angel of Yahweh that appears to Moses in a flame of fire (the burning bush) and an angel (as well as pillars of cloud or fire) that helps to guide the Israelites out of Egypt and slavery (Exodus 3:2 and 14:19-24). But we have already seen above that an angel can also serve God’s will in an oppositional manner, if necessary (as in Numbers). And there are passages which imply or state that an angel is involved as a “destroyer” on God’s behalf, as in the Passover incident (Exodus 12:23; cf. 2 Samuel 24:16). 3) Quite similar to the latter role of the messenger sent by God to cause injury is the “evil spirit” in the Hebrew Bible (especially in the so-called Deuteronomistic History, sixth century BCE and earlier). This figure, who is directly distinguished from the “spirit of Yahweh”, is sometimes sent by God to facilitate things happening in the way that God wants them to happen, sometimes inciting violence (see Judges 9:22-23; 1 Samuel 16:14-16; 18:10-11; 19:9-11; also see 1 Kings 22:19-22 for a “lying spirit”). The most important distinction between these “satans” (including the one in Job), “messengers”, or “evil spirits” and the evil Satan figure of later apocalypticism is that the Hebrew Bible’s satans and angels are almost always acting in conjunction with the will of Yahweh, or God. They are almost always sent by God to be an obstruction or to act as an adversary or prosecutor against some person or persons. However, even these same passages involving the Israelite God taking adversarial action against certain people could be interpreted differently by later Jews or Christians. This is the case with those in later centuries who did indeed hold a view of Satan as an evil figure opposed to God (such as Jubilees, where Mastema, Enmity personified, takes on some of these same roles, as we shall see later). With the full-blown, apocalyptic Satan, just about the only thing that is in accordance with God’s will is the existence of this figure, whose intentions are directly opposed to God but who unwittingly plays a crucial part in the unfolding of God’s plan (according to many ancient apocalyptic Jews and Christians). I am indebted to Neil Forsyth’s The Old Enemy, pp. 107-123 (cited in full in the previous entry) for getting me going on analyzing the passages (I disagree somewhat with his take on Zechariah). Categories: Apocalypticism, History of Satan, Mesopotamian and Israelite religions. January 9, 2006 . A rebellious fallen angel who later develops into a full-blown personification of evil (as Satan) first begins to appear clearly in our sources within the context of Jewish apocalypticism around 200 BCE (in book 1 of 1 Enoch). The story of this personified evil figure continues to develop and play an important role in early Christianity. Yet there are important predecessors in the Ancient Near East which help us to understand subsequent stories surrounding the figure of Satan. Among the predecessors is Angra Mainyu or Ahriman (the opponent of Ahura Mazda) within Zoroastrianism, which I have discussed here in an earlier entry on this blog. Oldest among these predecessors are the chaos-monsters (also gods) who are slayed by an up-and-coming Mesopotamian (or Hittite or Canaanite or Israelite) deity in traditions dating as far back as the third millenium BCE (our earliest evidence for literate civilizations). In particular, the portrayal of Satan in John’s Apocalypse (written c. 90s CE), which became the most potent early image of Satan as the ancient serpent or dragon, cannot be understood without reference to these older gods who threaten or even personify chaos and are ultimately defeated in combat (see especially Revelation, chapters 12-13). 1) A god among the pantheon engages in activity that threatens the well-being (or even existence) of other gods and the society of the gods. 2) The opposition from the chaos-god seems insurmountable and other gods desperately seek (with great difficulty) someone who can solve the problem. 3) Finally, a less prominent or younger god steps forward and acts as a hero in battling and successfully defeating and killing the monstrous threat, re-establishing order in the universe. Often, there are two rounds in the fight, with the hero losing the first. Sometimes (as in the case of Marduk vs. Tiamat and Yahweh vs. Leviathan) the slaying of the chaos-monster coincides with the creation of the world of humans by the hero-god. In essence, the hero-god has saved the entire cosmos from reverting to chaos and now has a new status as a chief or king among the gods. It is important to state that the gods who threaten to bring chaos to the entire cosmos are not inherently evil in these traditions, however, and they are indeed gods (which Satan is not within early Judaism and Christianity). Yet the role of the chaos-monster as opponent or adversary of the hero-god and the centrality of the battle between the two (“combat myth”) which ends in triumph for the hero are, in many respects, at the heart of Satan’s story and his function within early Jewish and Christian apocalyptic worldviews. Perhaps the most well known case of this mythology is the Babylonian story of Marduk’s slaying of Tiamat, the chaotic sea-monster and mother of all gods, whose husband, Apsu, had plans to do away with her noisy children, the rest of the gods. (As chaotic sea-monster, Tiamat is comparable to the Israelite Leviathan or the Canaanite Yamm). 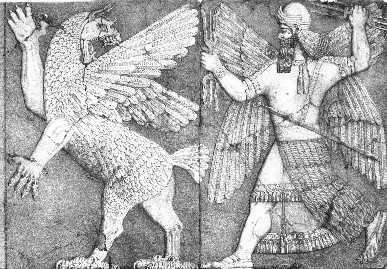 Marduk then uses the corpse of Tiamat to create the world as we know it. You can read that story in the Enuma elish (When on high) online. “Ellil appointed him (Anzu) to the entrance of the chamber which he had perfected. He would bathe in holy water in his presence. And fixed his purpose, to usurp the Ellil-power. And fixed his purpose to usurp the Ellil-power. And shall possess the throne and be master of the rites! he waited for the start of the day. Anzu flew off and went into hiding. For he (Anzu) had stripped the chamber of its radiance. Standard Babylonian version, tablet 1, iii, first millenium BCE; Stephanie Dalley, trans., Myths from Mesopotamia: Creation, the Flood, Gilgamesh, and Others (Oxford: OUP, 2000), pp. 206-207. And slit the throat of wicked Anzu. . .
Show prowess to the gods and your name shall be Powerful!” (SBV, tablet 2). A dart passed through his very heart. He (Ninurta) made an arrow pass through pinion and wing. . . He slew the mountains (symbolic of Anzu), inundated their proud pastures (ending drought). . . slew wicked Anzu. Here, then, is the essence of what scholars call the “combat myth” which, via the Israelite case of Yahweh vs. Leviathan, came to play an important role within the apocalyptic worldview, with its battle between the forces of God and the forces of Satan, the dragon or ancient serpent in John’s Apocalypse. For an online scholarly article about Ninurta and Anzu (and Azag, another combatant), go here. For Israelite instances of the combat myth, with Yahweh vs. Leviathan or Rahab or Behemoth or Tananim, see the following biblical passages: Psalms, chapters 74, 104; Isaiah chapter 27; Job chapters 40-41. You can view William Blake’s illustration of Leviathan and Behemoth (1825) online at the Tate gallery here. There are also several useful online overviews concerning Ancient Near Eastern mythologies and gods of the Sumerians, the Babylonians and Assyrians, the Canaanites, the Hittites and Hurrians. Excellent books on the relevance of Mesopotamian combat myths and chaos-monsters for early Judaism and Christianity (including Satan) include: Norman Cohn, Cosmos, Chaos, and the World to Come The Ancient Roots of Apocalyptic Faith (2nd edition; New Haven: Yale University Press, 2001), and Neil Forsyth, The Old Enemy: Satan and the Combat Myth (Princeton: Princeton University Press, 1989). Photo (above): Ninurta pursues Anzu, as depicted on a stone sculpture in the temple of Ninurta at Nimrud, Iraq. Drawing from Austen Henry Layard, A Second Series of the Monuments of Nineveh (London: John Murray, 1853), volume 2, plate 5. This full work, now in the public domain, is available online at ABZU. Categories: Apocalypticism, History of Satan, Mesopotamian and Israelite religions. January 5, 2006 . Welcome to ongoing discussions regarding the origins, development, and significance of personified evil — Satan and his demons — in early Judaism and in the history of Christianity. We will be tracing the history of Satan (a.k.a. the Devil, Beelzebul, Beliar, Mastema, Lucifer, Mephisto) and his minions from ancient Mesopotamian chaos-monsters to early Jewish and Christian fallen angels to modern portrayals in music, television, and film. To get a sense of what topics and sources may be covered in the next few months, you can look at my outline for the undergraduate course: “A History of Satan”. There are already a number of entries here on this blog that deal with topics relating to Satan and hell. Ideas associated with this personified evil figure are thoroughly embedded within western culture, and these discussions will be an attempt to partially unravel the layers in his story. Come again, and I’ll look forward to any historically-minded comments or questions you may have. UPDATE (Jan. 2): Check out the comments section, where significant (as well as not-so-significant) discussions have already begun. Photo: Dragon-like mythical figure, associated with the god Marduk, on the Babylonian Ishtar Gate (c. 575 BCE; now in the Istanbul Archeological Museum; photo by Phil). Images like this one may have inspired the story of Daniel slaying the dragon in the Apocrypha, which draws on a long tradition of slaying the chaos-monster. Categories: History of Satan. December 29, 2005 . As Jim Davila points out, there are now plans to make a hollywood film out of John Milton’s 17th century poetic Paradise Lost (book online here). Milton (1608-1674) brings together many of the biblical and post-biblical (including medieval) stories that attached to the figure of Satan or the Devil (on which see my brief comments on a conversation between Hades and Satan here). Regardless of whether this ends up being another myths-ploitation film which does very little justice to its sources (e.g. Troy), at least this will give me more to talk about in connection with modern depictions of personified evil in my “History of Satan” course (though not in time for this Winter term–oh well. As if there wasn’t enough Satan in films already). The Telegraph has a brief article on the plans for the movie here. There are a few websites devoted to Milton, with the more scholarly one here. Also, for an interesting conference paper which looks at the themes of Paradise Lost in relation to Star Trek, go here (bet you never expected that one). Categories: Film, History of Satan, Religion and popular culture. October 14, 2005 . Scholarly debates continue regarding what genre (type) of literature were the apocryphal Acts, with the Greek novel often being considered a close relative of these Acts by most. Certainly both the apocryphal Acts, which relate the miraculous deeds of the followers of Jesus, and the novels share in common the aim of entertaining (alongside teaching and admonishing certain values or behaviours). In the Acts of John, the disciple John is depicted on his journeys to demonstrate the power of God (dating sometime in the second or early third century; available online here). Among these demonstrations or signs are the repeated resurrections of various characters in the story, from bad guys like the priest of Artemis to good guys like the permanently sexually-abstinent Drusiana. Resurrection of the dead is John’s favourite miracle, so to speak. Just about everyone converts as a result of these miracles, including the aforementioned bad guys, so there is a purpose to it all. One of the “miracles” of John that stands out, however, involves bed-bugs. While staying in an inn at Ephesus, John is trying to catch some wink-eye while other of his followers talk quietly in the background. The bed-bugs are driving John nuts, and so he commands, “I tell you, you bugs, to behave yourselves, one and all; you must leave your home for tonight and be quiet in one place and keep your distance from the servants of God!” (60). That we, the readers, are meant to be entertained and to laugh is suggested by the fact that John’s followers do laugh, and think that John is just joking (he’s not really commanding bugs, is he?). To these followers’ surprise, they find a mass of bugs waiting just outside the door in the morning, and John says that since the bugs have behaved themselves, they can go back home to bed. But even in this humorous story there is a lesson. Be thou like the bed-bugs, who quietly listen and obey: “This creature listened to a man’s voice and kept to itself and was quiet and obedient; but we who hear the voice of God disobey his commandments and are irresponsible; how long will this go on?”, queries John (61). (All translations, again, are from Schneemelcher). “In great trouble and distress I left the city, and I sat on a dung heap worm-ridden in body. Discharges from my body wet the ground with moisture. Many worms were in my body, and if a worm ever sprang off, I would take it up and return it to its original place, saying, ‘Stay in the same place where you were put until you are directed otherwise by your commander” (Testament of Job 20:7-9; trans by R.P. Spittler in Charlesworth, OTP). Categories: Acts (of Apostles), Christian Apocrypha and "Gnosticism", History of Satan. August 30, 2005 . The term “TRUE” Kingdom of God is used repeatedly because there are many space alien races that through the centuries of this civilization (and in civilizations prior) have represented themselves to humans as “Gods.” We refer to them collectively as “space alien races in opposition to the Next Level,” what historically have been referred to as “Luciferians,” for their ancestors fell into disfavor with the Kingdom Level Above Human many thousands of years ago. They are not genderless – they still need to reproduce. They have become nothing more than technically advanced humans (clinging to human behavior) who retained some of what they learned while in the early training of Members of the Level Above Human, e.g., having limited: space-time travel, telepathic communication, advanced travel hardware (spacecrafts, etc. ), increased longevity, advanced genetic engineering, and such skills as suspending holograms (as used in some so-called “religious miracles”). The Next Level – the true Kingdom of God – has the only truly advanced space-time travel vehicles, or spacecrafts, and is not interested in creating phenomena (signs) or impressive trickery. These malevolent space races are the humans’ GREATEST ENEMY. They hold humans in unknown slavery only to fulfill their own desires. They cannot “create,” though they develop races and biological containers through genetic manipulation and hybridization. They even try to “make deals” with human governments to permit them (the space aliens) to engage in biological experimentation (through abductions) in exchange for such things as technically advanced modes of travel – though they seldom follow through, for they don’t want the humans of this civilization to become another element of competition. They war among themselves over the spoils of this planet and use religion and increased sexual behavior to keep humans “drugged” and ignorant (in darkness) while thinking they are in “God’s” keeping. They use the discarnate (spirit) world to keep humans preoccupied with their addictions. These negative space races see to it, through the human “social norm” (the largest Luciferian “cult” there is), that man continues to not avail himself of the possibility of advancing beyond human. Heaven’s Gate, “Crew from the Evolutionary Level Above Human Offers — Last Chance to Advance Beyond Human,” 1996 (Copy at: http://www.wave.net/upg/gate/lastchnc.htm). One could say that the beginnings of plugging aliens into an apocalyptic worldview began with science fiction films such as The Day the Earth Stood Still, which has the alien (and his sidekick robot) clearly in the role of the alien saviour figure and destroyer of evil (evil associated with the military activity of humans–the nuclear bomb and the Korean war were in mind). The alien saviour figure is, in this case, clearly in the role of a Jesus-figure (he dies and raises from the dead). For the script of the movie, go here. For a brief and rough overview of the plot and its religious themes, go here. For further discussion of apocalypticism and apocalyptic groups throughout western history (including Heaven’s Gate), go to the PBS site Apocalypse!. Categories: Apocalypticism, History of Satan, Religion and popular culture. June 30, 2005 .